Do you mean guitar chord notation (not fret board notation)? If so, this feature is coming in the future (see the 2.0 post in this forum). They're working hard to track down bugs in 2.0 before releasing it to the public. Not a moderator, just another user. I don't work for Symphony Pro, but as a music teacher, I have a vested interest in having a fully functional notation program for the iPad. And when I can answer a question in the forum, I take the time to answer. I certainly don't speak for Symphony Pro in any official capacity. Chord notation as you are looking for (over the top of the staff) is coming in 2.0. One of the Symphony Pro developers recently mentioned that they are aiming for the end of August for a release date for 2.0. 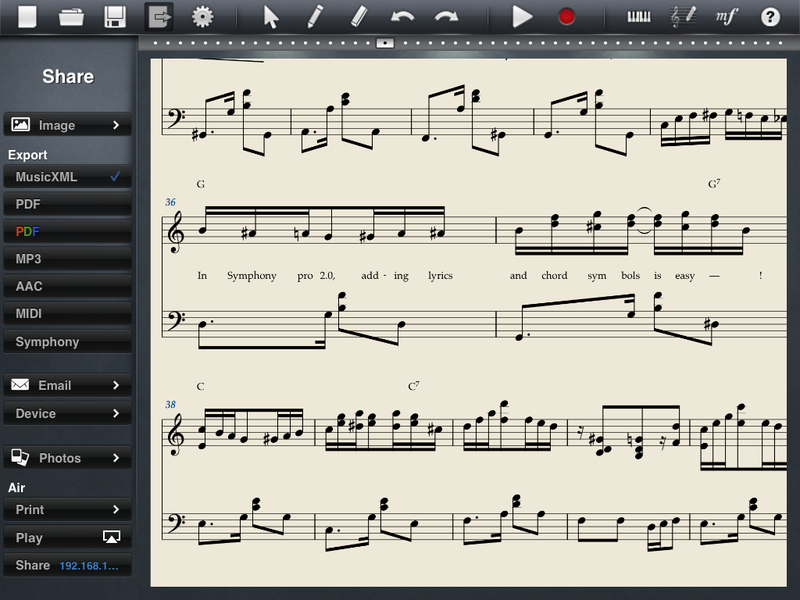 Here's an example of how chord symbols and lyrics will look in 2.0. The chord tool also recognizes augmented, diminished and sustained chords as well as inversions and fingerings, and displays them properly. Those chord symbols are very small. Hopefully 2.0 will allow sizable fonts up to at least 36 pts. We ask for so much, recognizing the massive workload involved on development's end. Please, SymDudes, know that it's NOT ungrateful complaining. Rather, it's amazing to see the only product of this type for tablet usage evolving with so much direct user input. For that, we are grateful. I will see if I can make the chord symbols bigger. At this time you won't be able to adjust font sizes or add bold text. Let me know if you have any feedback about the look of the lyrics or about the vertical positioning of the chords and lyrics, because the vertical positioning can not be adjusted in 2.0. Because I wasn‘t able to find the Chord Tool in symphony 5.0 can anybody help me how to enter chord names? The chord tool can be found by switching & activating the Score Symbols Expandable button to the Text category (A icon, shown right), which will bring up the respective toolbar; then look for the C7 icon (first from left). Next, tap on a bar location to begin placing chords, with spacebar to advance the cursor, as was the case previously. The manual section on chord notation covers entry in Pencil mode, which is largely similar to previous versions, but let us know if you need any further clarification. Will Symphony Pro look into chords playback just by keying in the chords ? Instead of spelling out every single notes of the chord harmony ?